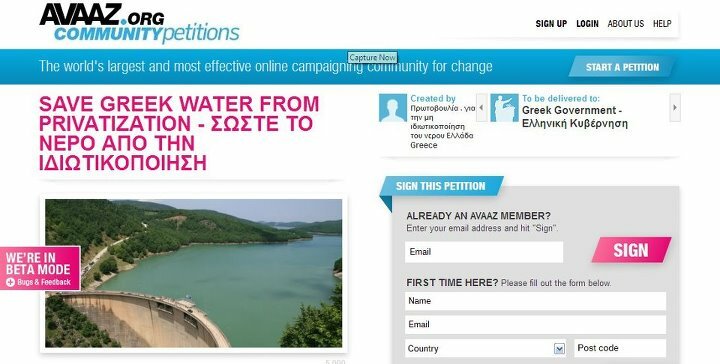 The Initiative for the non privatization of water in Greece was founded in July 2012 in an effort to inform the public opinion and to interconnect different organizations and people that are reluctant to accept the right of a private corporation to control a public good necessary for the survival of people, plants and animals. The initiative has no funding and it is a volontary undertaking of people of different expertise and political grounds that concur on the democratic and rational management of this precious good. While in Greece there is no precedent, the international experience has shown that the privatisation of water has resulted often in the skyrocketing of prices and in some cases in the deterioration of water quality. Although the trend in Europe is the return of water supply companies management to the hands of municipalities, once again with a twenty year delay the Greek state is being ‘modernised’ towards policies of the past. What will be the fate of the water supply in sparsely populated, remote areas that equal high costs for private initiatives ? To what ecological burden can lead the loss of further social control as to the amount of water that is pumped and where it is sold? What exactly will be sold at the end and to what damage to the society as a whole since the high-cost investments of these enterprises are their infrastructures that have already been paid at the expense of taxpayers? Such issues make us particularly cautious to the rhetoric of ecological “sesitivities” being showcased by the proponents of private initiative in the field of water resources and render us skeptical as to the willingness with which the Greek government seems to be eager to ‘ disengage’ itself from a multi-dimensional issue such as the management of water resources of the country. SAVEGREEKWATER is a Greek citizens’ initiative that opposes corporate privatization of our water resources and its distribution. Clean affordable water is a human right and must remain a public commons. Our initiative wants to inform all concerned on the implications of allowing corporations to comodify and profit from our limited water resources. The privatization of water is first a question of democracy. If we cannot control our supply of water do we really control anything at all? Our campaign wants to use this opportunity to sensitize the public on the larger issue of careful water management for private and agricultural use. Join the SAVE GREEK WATER initiative against water privatization. Help shape the future of our country.